Where did you get the plot from? Can you share the link? Hi Jester, thanks for an interesting post. Perhaps there is no cat, but we would like to learn this the hard experimental way, not the presumptive philosophical way as some Confucius lovers would want. We could also learn why there would eventually be no black cat - neither in the sky nor in the mine - the hard theoretical way, thinking more deeply about the dark room (space-time/quantum vacuum) and considering motivated mimetic dark matter models for instance (arxiv.org/abs/1409.2471). the method adopted by the Planck collaboration to derive this result. a cosmic variance limited experiment with angular resolution comparable to Planck"
So Planck won't get exclusion limits better than the CVL line. 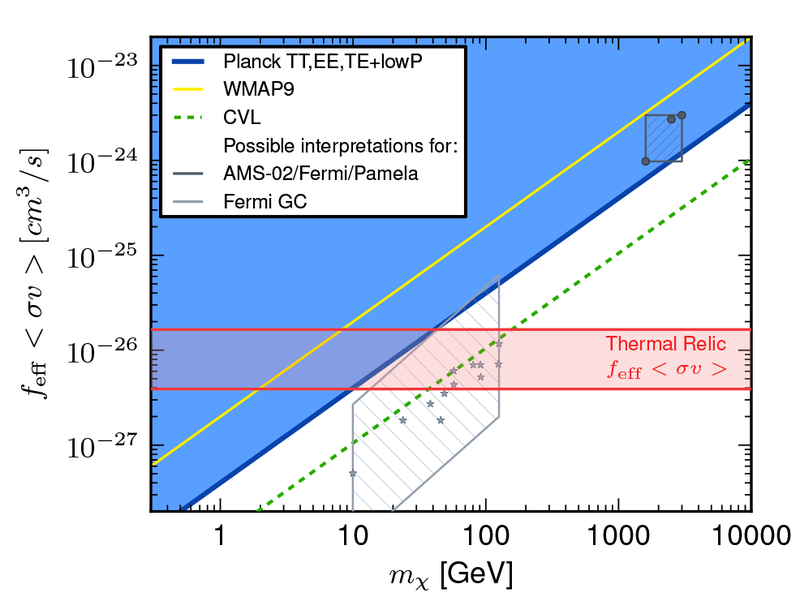 Thus, Planck seems to exclude entirely thermal relic warm dark matter with a WIMP-like annihilation cross-section. Given the multiple problems with thermal relic cold dark matter with a WIMP-like annihilation cross-section pointed out by Warm Dark Matter proponents, the combined exclusion would seem to rule out all thermal relic dark matter with a WIMP-like annihilation cross section. The lambda CDM model (which uses a definition of Cold Dark Matter that includes both thermal relic WDM and thermal relic CDM), requires a thermal relic. So, if there is thermal relic dark matter it must not have weak force annihilation cross-sections and must instead be truly sterile with respect to the weak, strong and EM forces, although it might have self-interactions that do not lead to DM annihilation or at a different cross-section. CDM in the absence of self-interaction doesn't seem to work at all to fit the galaxy scale data, so at this point you either have thermal relic WDM as keV scale sterile fermions that interact only via gravity and fermi contact forces, or there is no thermal relic DM at all. Such particles wouldn't be produced at the LHC or would be to light to detect in current direct dark matter detection experiments. Other studies also place very strict bounds on purely bosonic DM. Axions escape this issue because it is not a thermal relic form of DM, but have other issues. Of course, none of this rules out a fifth force or force modification approach.